Our Alpha Omega stole is made out of 100% smooth weave polyester, is fully fused with reinforced embroidered stitching and a side cord keeps stole comfortably in place. 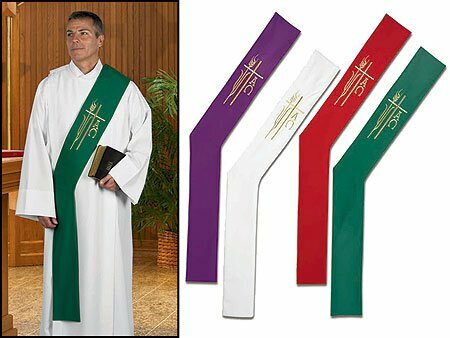 This set of 4 stoles will provide appropriate wear for the seasons of Lent, Pentecost, Confirmation, Epiphany, Ordinary times, Advent, Christmas, and Commemoration Sundays. Available in Green, White, Purple and Red. Specify color when ordering.